Part of the spiritual role and nature of raccoons is expressed in the fact that they traverse the three worlds of air, earth, and water. They are arboreal, climbing and living in the upper world of trees and hollow stumps, yet they travel almost exclusively on the ground. Raccoons also have the peculiar habit of seeming to wash their food, which gives them a special connection to the water. Raccoons are also a major source of food themselves, which associates them with fecundity. They are very tricky animals as well, causing their spirit to overlap with the nature of Trickster himself. This character trait that makes Trickster like a Raccoon Spirit is specifically the ability to mislead. 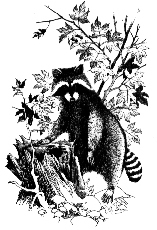 This aspect of the raccoon is well known to hunters, who soon discover their clever techniques for misleading their pursuers, such as doubling back on their own trail, or hiding in the hollow of a tree. This misdirection is also associated with their nocturnal lifestyle, where the darkness renders all their pursuers at least partly blind. A number of major spirits have close ties to the raccoon nature. One of these is Wojijé, the Meteor Spirit. He is the spirit of any "star" that has a tail. Thus he is represented as a child owning a ball with a raccoon tail attached to it, a toy which he is always throwing around.1 In another story, he wears a complete raccoon skin from head to toe.2 Wojijé is a spirit of fecundity, and stands opposed to purely predatory animals such as dogs. Thus in the upper world the raccoon is identified with the comet or meteor; but it also has an identity with a spirit known as the "Red Star." Each of Red Star's brothers except the youngest, who does not hunt, returns home each day with a particular kind of animal. All the brothers eventually turn into the kind of animal that he habitually hunts except the one who hunted raccoons. He turned into the Red Star.3 Red Star is the Evening Star, as his younger brother is Morning Star, but in any case, Red Star is said to be the Waterspirit Bluehorn.4 Thus the raccoon is at once identical to stellar objects and to the spirits that dwell in rivers and lakes, which reflects the fact that the raccoon is both arboreal and strongly associated with water on account of its unusual habit of taking its food to the edge of the water and immersing it before it begins to eat. This Waterspirit aspect of raccoons is expressed in Trickster. Trickster, like Wojijé, has a raccoon blanket which he always carries with him. Trickster himself is strongly identified with the raccoon nature, a fact expressed in his eating of a whole raccoon family,5 where consumption may express the internalizing of the nature of what is consumed, as it is almost universally in mythology. In one of his misadventures, Trickster lies by a river bank with an elk skull on his head and his raccoon blanket draped over his body. This makes him look like a spirit, and in this context he is portrayed variously as an Elk Spirit or a Waterspirit. He misleads the people into thinking this in order to get them to crack the skull in which his head has become lodged. However, in the end, like a Waterspirit, he allows medicines to be made out of part of his "body," namely the elk skull in which he jammed his head.6 This again identifies the raccoon nature with the Waterspirit who is particularly noted for misleading people. Links: Bladder, Trickster, Bluehorn, One Legged One, The Meteor Spirit, Fish Spirits, Tree Spirits, Waterspirits, Grasshoppers, Frogs. Stories: mentioning raccoons: Bladder and His Brothers, Lake Wąkšikhomįgra (Mendota): the Origin of Its Name, The Spirit of Maple Bluff, A Raccoon Tricks Four Blind Men, Raccoon and the Blind Men, The Were-fish, Trickster and the Mothers, Grandfather's Two Families, The Green Man; about giant raccoons: Lake Wąkšikhomįgra (Mendota): the Origin of Its Name, Bladder and His Brothers; involving raccoon skins: Raccoon and the Blind Men, The Abduction and Rescue of Trickster, The Raccoon Coat, The Elk's Head, Wojijé. Themes: a group of men hunt a raccoon and in the process are led to a spirit being: Bladder and His Brothers, Lake Wąkšikhomįgra (Mendota): the Origin of Its Name, The Were-fish, The Spirit of Maple Bluff; people are led astray by a raccoon: Raccoon and the Blind Men, Bladder and His Brothers; a spirit tricks men into fighting one another: A Raccoon Tricks Four Blind Men, Hare Visits the Blind Men, Raccoon and the Blind Men; possessing a raccoon blanket: The Abduction and Rescue of Trickster, The Raccoon Coat; an animal spirit transforms himself from one kind of animal into another: The Orphan who was Blessed with a Horse (Thunderbird > horse), Bear Clan Origin Myth (bear > blackbird > bear), White Wolf (wolf > dog), A Man and His Three Dogs (wolf > dog), The Dog that became a Panther, The Were-fish (raccoon > fish), Lake Wąkšikhomįgra (Mendota): the Origin of Its Name (raccoon > fish), The Spirit of Maple Bluff (raccoon > fish). 3 Paul Radin, "Morning Star (Wiragošge Xetera)," Winnebago Notebooks (Philadelphia: American Philosophical Society) Notebook #8: 1-93. 4 Paul Radin, The Evolution of an American Indian Prose Epic. A Study in Comparative Literature, Part I (Basil: Ethnographical Museum, Basil Switzerland, 1954) 80-84. Apparently the story was obtained by Sam Blowsnake of the Thunderbird Clan from an anonymous older member of the tribe ca. 1912 (Ibid., 21). 5 Paul Radin, The Trickster: A Study in American Indian Mythology (New York: Schocken Books, 1956) 28-31. 6 Radin, The Trickster, 32-35. 7 Charles E. Brown, Lake Mendota Indian Legends (Madison: State Historical Museum, 1927) 2-3; Charles E. Brown, Lake Mendota Indian Legends (Madison: State Historical Museum, 1927) 3-4; a slightly shorter version exists in James Davie Butler, "Taychoperah, the Four Lakes Country," Wisconsin Historical Collections, 10 (1885): 64-89 [64-65]; From the letters of Rev. William Hamilton, 4800 Dorsey Papers: Chiwere & Winnebago 3.3  (National Anthropological Archives, Smithsonian Institution, ca. 1885). 8 Brown, Lake Mendota Indian Legends, 2-3. 9 Radin, The Trickster, 20-21. 10 John Harrison, "Story of a Raccoon, " in Paul Radin, Winnebago Notebooks, Freeman #3892 (Philadelphia: American Philosophical Society) Winnebago III, #11a: Story 9: 119-124. Translated by Oliver LaMere. 11 Charles Edward Brown, Moccasin Tales (Madison, Wisc. : State Historical Museum, 1935) 4-5. Informant: Oliver LaMère of the Bear Clan. 12 Paul Radin, "The Bladder," Winnebago Notebooks (Philadelphia: American Philosophical Society) Notebook #27: 1-61; "The Morning Star, A Winnebago Legend," collected by Louis L. Meeker (National Anthropological Archives, 1405 Winnebago, A.D.S., Nov. 22, 1896); "The Morning Star," in David Lee Smith, Folklore of the Winnebago Tribe (Norman: University of Oklahoma Press, 1997) 105-110. 13 Walter Funmaker, The Winnebago Black Bear Subclan: a Defended Culture (Ph.D. Thesis, University of Minnesota: December, 1986 [MnU-D 86-361]) 108. 14 Paul Radin, (untitled), Winnebago Notes, Freeman #3858 (Philadelphia: American Philosophical Society) 13, 16. This is a typewritten MS of the conclusion of the "Blue Man."